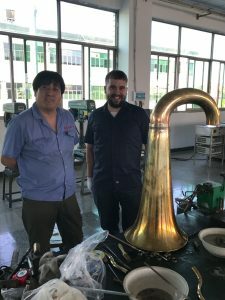 Here at Wessex Tubas, we take the utmost care in everything we put our name to – ensuring every instrument under the Wessex brand is personally inspected and play tested to ensure you receive the highest quality instruments available. That’s why, once every three months, we send at least a couple members of our dedicated team of experts to our factory to quality assure our newest instruments before being delivered to you. “Every three months I go to our factory in China to oversee the development of new products, quality assure the most recent production batch, and work with factory production to deliver ongoing quality improvements. “Previous visits have always been one week, but for the first time ever since we opened, we spent two weeks at the factory, purely because there was so much to do! “I was delighted to have ex-US Army band Tuba player, Chuck Nickles, accompanied me on my visit; Chuck is also a great Trombone and Euphonium player, as well as a skilled brass technician having previously worked at various German and American brass factories. “An integral part of every visit is the quality assurance of new products; with every single instrument being personally examined. 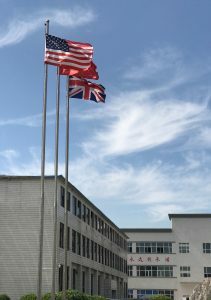 “This is a huge piece of work which we believe no other company undertakes so rigorously in China, but I consider vital to ensure Wessex instruments remain of the high quality our customers have come to expect. “New product development is the most enjoyable and rewarding activity – seeing the idea of a new instrument take shape to become a playing reality. “Raising the quality standards is most important, so the factory learn what we don’t find satisfactory and put new procedures or equipment in place to move up to the next stage, with our long term aim of achieving perfect quality, every time. “Met from Beijing airport, we arrived on the Sunday to have a good night’s sleep before beginning work at 8am on Monday. “As is usual on our first day at the factory, we started the morning with a meeting with brass factory management to discuss progress since our last visit, and our plans for the two-weeks ahead. “Then, we set off to look at the newly designed instruments and check, so there is time to make changes and then test again while we are still at the factory. Two completely new tuba models were there awaiting us – as well as the first four of Wessex’s new entirely handmade 6/4 CC tuba, the ‘Chicago’ in two variations with 18” and 20” bells. “Having enjoyed a very exciting first morning, at 12pm outside the factory a noisy market has set up selling food to the 2,000 staff that work there. “While the staff enjoyed their 2 hour lunch break, we headed off to a restaurant for our first taste of delicious Chinese food. “After lunch, Chuck got to work with the always jolly Mr. Qui on new product development, while I got to start production inspection. 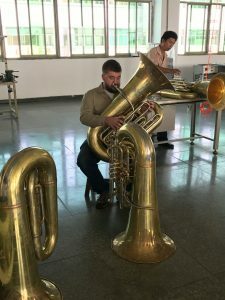 “I was greeted with the sight of over 200 Tubas and Euphoniums covered with clear plastic dust covers, awaiting to be inspected with a sign that reads in Chinese ‘Little Dragon products for inspection’. Little Dragon is the factory staff’s pet-name for Wessex Tubas. “The instruments all lined up reminded me of a Tuba ‘terracotta army’ waiting to be brought to musical life. 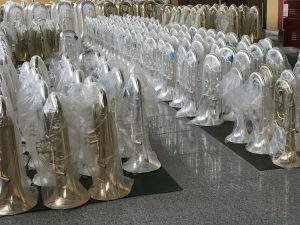 “An inspection table is set up for me and some staff allocated to help – and I start off with checking a few of the ranks of Euphoniums. For each one, I firstly looked at it from all angles, checking to see if the finish is good enough to satisfy Wessex most discerning customers. “I looked for any small dents, scratches, surplus solder around joints, poor polishing, or dirt under lacquer or silver. I noted the finish has continued to improve in the two years we have been making these inspection visits. “As well as Wessex ensuring that everything that reaches our UK and US warehouses is good – our visits to the factory also serve to highlight to the factory where they need to improve, so things continue to get better. “I noticed the Euphonium finish is now exceptional – this year, new mechanical polishing has been implemented which gets into the most difficult to reach spots, so they are equally shined. Also, the extra polishing the factory does especially for Wessex, and double thickness silver-plating, enhances the finish – and durability. “If any defect is found in the finish, the affected instrument is taken away for correction or entirely re-finish if it’s something which can’t be repaired. A woman from the quality assurance department noted down every defect I found, so they can continue to improve their processes going forward. “I then move onto the slides, pulling out each one and check they are not too tight or, conversely, too loose on each leg, and the alignment is correct. I look inside for finish and check water key. A little burr inside hole for water key means slide is sent away for that to be removed, so it does not impede air flow. “Moving on to valves, each one is removed and finish checked to ensure no rough edges, holes or imperfections. I check that the valve venting hole has been applied in the correct position and check that valve alignment is good in both up and down positions. “Then on replacing valve check, the valve cap thread is good and screws up easily. That has been a big problem in the past, but now is good on most valves. Any which I felt are not as easy to thread as they should be are sent away for improvement using special die. “Having checked finish and mechanics, I now undertake play test. My trusty iPhone tuner is brought out and a chromatic scale is played, checking the intonation throughout the range. “The tuner presents a nice smiley face whenever note is in tune and the factory staff loved to see this! If you’d like to know more about any of the instruments mentioned above, please visit our online shop.